Age-Related Macular Degeneration (AMD) is the leading cause of vision loss in older American adults and the most common reason patients are referred to Dr. Gosslee for further evaluation, treatment and care. Patients afflicted with AMD may note a worsening of their central vision while retaining good peripheral vision. Many patients with macular degeneration share a common misconception and fear that the disease will automatically progress to blindness. As suggested by its name, AMD only affects the macula. The macula is the central part of the retina responsible for detailed visual tasks. Regarding the last risk factor, much research has been done regarding the genetics of macular degeneration. Although there is currently no way to definitively predict who will or will not develop AMD, those with affected relatives are at significantly higher risk. As a result, adult relatives of AMD patients should schedule an appointment with a retina specialist and undergo a baseline evaluation and dilated exam. Is there more than one kind of AMD? Generally, patients with AMD are grouped into one of two categories – those with dry macular degeneration and those with wet macular degeneration. Dry AMD is characterized by accumulation of yellow deposits called drusen, thinning of the macula, and gradual deterioration of vision. Wet AMD is so called because it is marked by an accumulation of fluid and/or blood beneath the retina. In contrast with dry macular degeneration, patients with wet AMD often, but not always, experience sudden and severe visual losses. What tests are helpful in aiding diagnosis? Dry and wet macular degeneration impact vision in different ways and are also treated quite differently. Our physicians will use a variety of clinical tests and exam techniques to better characterize your individual situation, make an accurate diagnosis, and optimize treatment. During an initial visit for macular degeneration, patients typically undergo two tests: Fluorescein Angiography (FA) and Optical Coherence Tomography (OCT). These tests may even be performed prior to consulting with Dr. Gosslee. FA is considered the “gold standard” for differentiating between dry and wet AMD. It involves the injection of a small amount of vegetable-based dye through a patient’s peripheral vein – usually the arm or hand. Shortly after, a certified ophthalmic angiographer will take a series of time-dependent retinal photographs. The injected dye lights up the retina’s intricate vascular network. This helps our specialists pinpoint areas of leakage in those patients with wet macular degeneration and target specific zones with specialized laser therapy when needed. OCT is a newer, non-invasive, quick exam that has gained universal acceptance during the last decade and is now used by many ophthalmologists to visualize the retinal microarchitecture. Using reflected light rays, OCT provides a detailed, highly magnified, cross-section view of a patient’s macula. Sometimes, it will uncover tiny areas of fluid or retinal irregularity not readily apparent to a retina specialist during a microscopic exam. Despite recent advances in ophthalmic imaging, there is no single test that can be relied upon to direct treatment and clinical decision-making. A patient’s relationship with Dr. Gosslee is at the core of our practice philosophy, and good patient-physician communication is critical. Important decisions about retinal health are very much a joint effort. The patient’s perception of his or her visual health and the patient’s perception of any vision changes, however slight, is every bit as important in directing care as are the clinical tests. As a result, every patient diagnosed with macular degeneration should establish a daily routine for monitoring their own vision. This is most simply and reliably performed with an Amsler grid, a simple graph paper-like patchwork of straight vertical and horizontal lines, which we are happy to provide at no cost – simply ask one of our nurses. 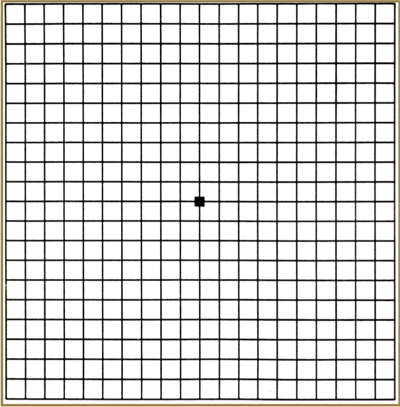 Amsler Grid as it might appear to someone with age-realated macular degeneration. Often, patients with subtle progression of macular disease will report new “waviness” or “missing areas” when monitoring their grid. 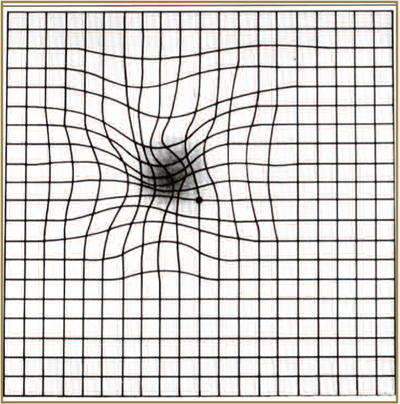 Should you or a family member notice new changes on an Amsler grid, contact us promptly. One of our retina specialists or trained ophthalmic nurses is always available to consult with you by phone. As a general rule, patients who receive treatment in a more timely fashion tend to fare better than those who delay evaluation by a retina specialist. Medical researchers have thrown themselves fully into the battle against macular degeneration, and dramatic progress has been made in the effort to combat age-related vision loss. The most promising new treatments are medications that block a molecule called VEGF (Vascular Endothelial Growth Factor). VEGF causes growth of “leaky” blood vessels in wet macular degeneration. These medications include Avastin, Lucentis, and Eylea. All of these medications are introduced directly into the eye through a tiny needle. While the thought of an “eye shot” might cause many to cringe, in our experience, there is little, if any, patient discomfort, and the spectacular visual gains far outweigh any fears. In contrast to prior therapies, these medications have actually improved vision for many patients with wet macular degeneration. Several large national and international studies have shown that Avastin, Lucentis, and Eylea all work well. Your retina specialist will discuss with you which medication may be best suited for your situation. In general, repeated injections are the norm in order to keep the fluid from recurring. Frontiers in treatment of wet AMD include finding medications that may even better restore vision and prolong the interval between injections. Dr. Gosslee is involved in several of these cutting-edge treatment trials. Should you have an interest in participating in a trial, please inform your retina specialist during your next visit.